The people of the State of British Southern Cameroons | Ambazonia stood up like one wo/man this 22nd day of September 2017 to say No to the occupation of their homeland by the Franco-Camerounese republique, whose agents have consistently and relentlessly meted out undeserved punishment and death to a growing number of our citizens – the People of the State of British Southern Cameroons | Ambazonia. Here is a video of what happened today in the homeland – our people defying the Franco-Camerounese govt agents’ declaration of state of emergency in our homeland. Our people came out in numbers with nothing but song, determination and peace plants. The Franco-Camerounese armed agents still found an excuse to shoot dead a number of our citizens. The tally is yet to be made. The Restoration of the Independence of the State of British Southern Cameroons is a Task that Must Be Done. and REAL OCCUPATION by the republic of Franco-Cameroun. The Franco-Camerounese leadership is on notice – from the People. 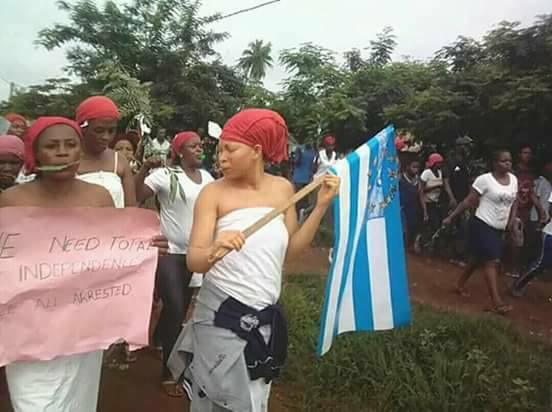 Citizens of Belo, Boyo County, State of British Southern Cameroons, join in the global resistance.